Using Forms in Google Documents allows you to create a quiz of questions of all types–true/false, multiple choice and short answer. Along with this feature of administering and collecting the answers for a test or quiz, you can also use the Flubaroo script to grade multiple choice and or true/false questions. Flubaroo is a free script that you can use grade the quizzes that you administer through Google Docs. Flubaroo provides great step-by-step directions for using the script. I’ll give an quick overview of how it works. First, create your multiple choice quiz using Forms in Google Docs (get directions here). Then take the quiz yourself and have students take the quiz (you can embed it in a webpage or direct students to the URL for your form). Now instead of trying to grade the spreadsheet cells you will insert the Flubaroo script by selecting it from the “insert” menu in your spreadsheet. 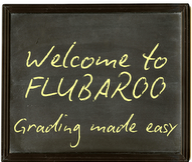 Once the Flubaroo script is inserted just select it and it will grade the quiz for you. Watch the video below for a demonstration of Flubaroo. This activity could be a good get-acquainted activity for new students. 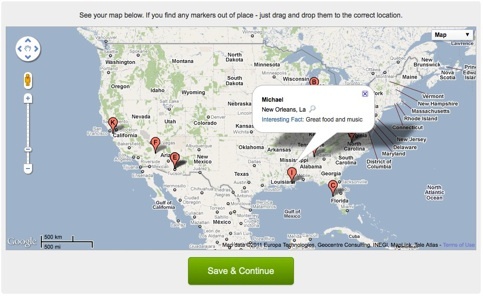 A Google Form can be created, data collected in the spreadsheet view and then data entered into BatchGeo creating an annotated map. Note – You could find out: where students were born; the farthest they’ve ever traveled; their favorite vacation spot; if they could live anywhere in the world; etc. 4. Send students to the blue URL at the bottom of the form-creation page. Note – You can use TinyUrl.com to shorten the address! 5. Give students time to fill out the form. 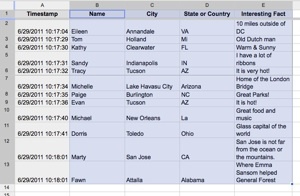 1.Go to the spreadsheet that collected the form data. – Go to the Google Docs homepage (docs.google.com) and click the link with the title of your form. 2.Click and drag to select the data (including the column headers). 2. Paste the data into the provided area. 3. 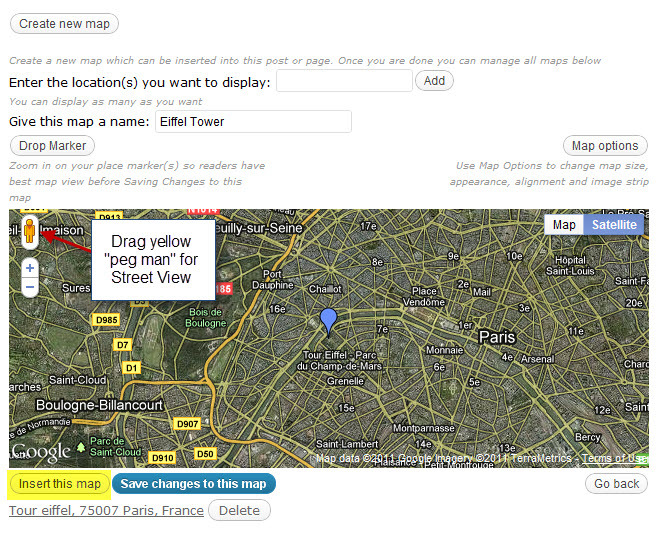 Click the “Map Now” button. 4. Click a placemark on the map to reveal the student’s name and interesting fact. To answer the question: “Do I need a Gmail account to access Google Docs?” the following video explains the answer of “No”. You don’t need a Gmail account but you DO need a Google Account. 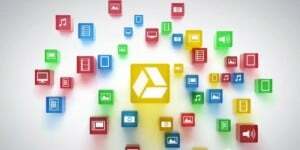 That Google Account can have any type of email account with it. This video explains the how-to. 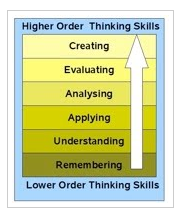 A revised Bloom’s Taxonomy–comparing digital techniques to traditional standards that Bloom created. This essay on ways to use free technology in schools to help students reach each level of Bloom’s Taxonomy is a good resource. A short wiki version of information is posted on Free Technology For Teachers on April 16, 2011 but a more indepth source is Andrew Churches’ website, Educational Origami. Andrew Church has several good resources–Starter Sheets– for teachers to introduce a tool, technology or activity that can be used in the classroom, as well as 21st Century Learning and 21st Century Teaching. 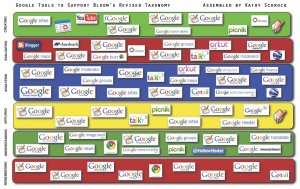 Google Tools for Revised Bloom’s Taxonomy.